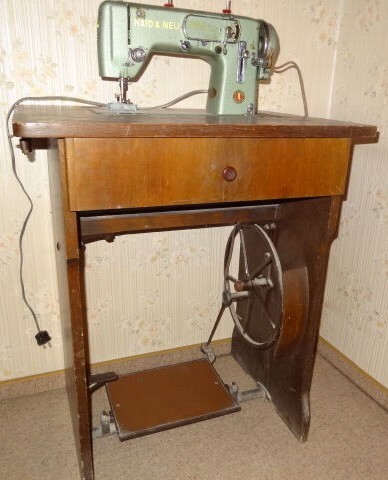 I’ve been looking at this machine on eBay for a month – something about it intrigued me. But no, I don’t need another one of those, I kept telling myself, I already have a brilliant zig-zag with fancy stitching cams… I don’t want another fixer-upper, I would rather be sewing… I already got black machines… But when it started dominating my dreams, I figured it had gone far enough, surely £35 was not worth the bother, I should just get it and see what it’s like. The poor thing arrived covered in tar and with crumbling paintwork and a hundred pins dispersed throughout the mechanism. The photo above is after the first round of tar removal, which turned out to be finely shredded rubber from a motor belt mixed with grease and melted plastic from the motor. Picking out the pins from the joints was also a remarkable experience that I would prefer not to repeat. I first thought the machine might have been built in Japan, but there were no “JA” numbers anywhere inside it, so probably not then. The serial number was also a bit too high for that, counting around 4.5 million. Harris were known to import a lot of machines from Germany before WWII, so may be it’s German or anyhow European? I looked all over the internet for information on this machine, but only found a single mention of a similar machine sold on eBay several years ago. They did not know the maker either, but they had a manual and cams with it, so at least I now knew what they looked like! After asking around, help arrived, John asked Jurg (thank you both!) and Jurg identified it as a Haid & Neu Primatic, made in 1950s in Karlsruhe, Germany. In 1958 (or 1954?) 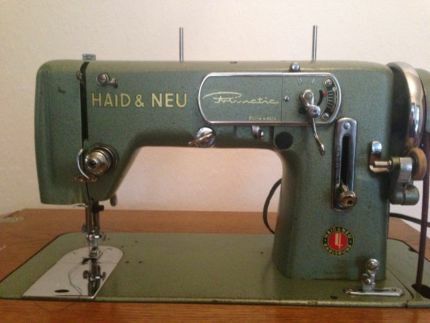 the Haid & Neu factory was taken over by Singer, see singersewinginfo.co.uk for more information. 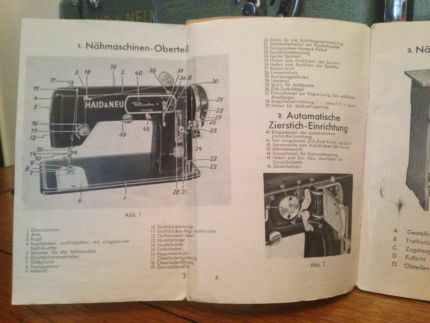 I looked around on the internet and found some pictures of the original Haid & Neu Primatic, with manuals, cams and all. This is indeed the same machine. The machines I’ve seen were metallic green, but the advert and the manual show a black one. The cams are inserted from the front of the machine. They are quite small: about 3.5cm in diameter with a shaft hole of 1cm. I discovered that a modified Singer flat cam would work, it’s got the right size but the positioning pin needs to be further out and the central hole is too big. But I have 30-something of those cams, so fashioning a collar for the cam shaft may have just become my next project. 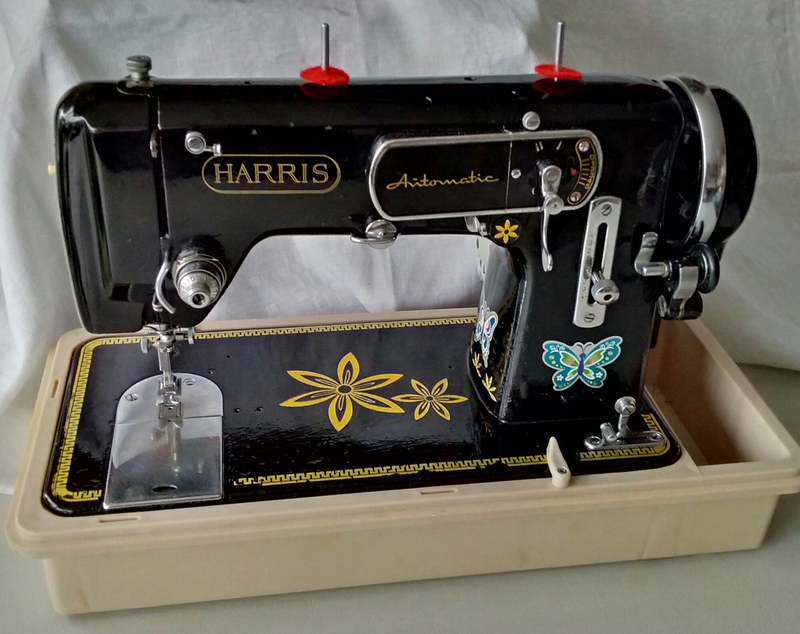 After cleaning, touch-up and a spot of embellishing, the machine was ready for a new motor and some sewing! 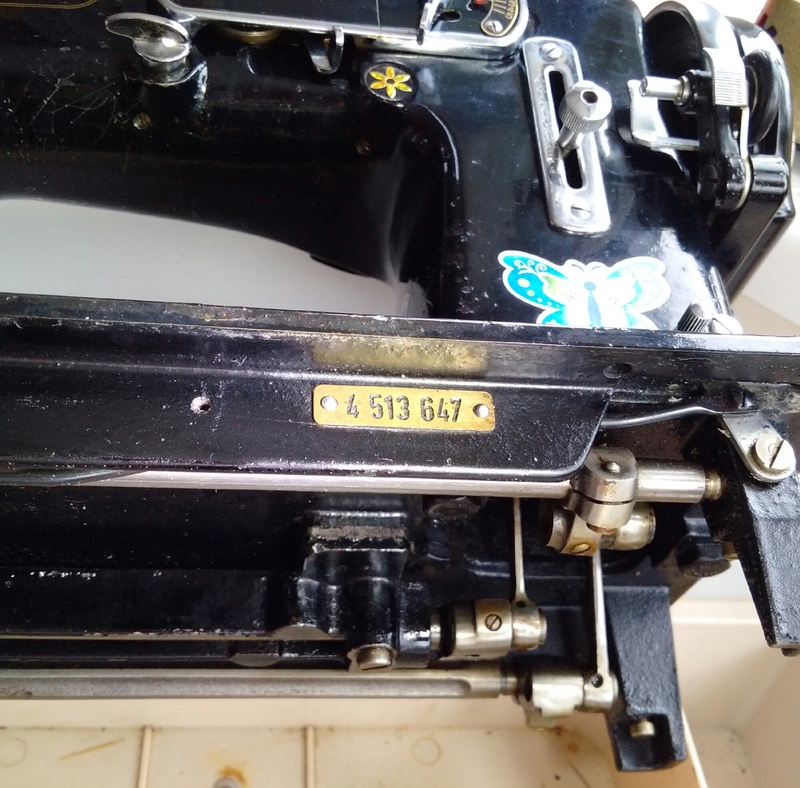 This machine has a separate zig-zag mechanism that does not rely on cams, yet it is not limited in its fancy stitching. I should explain here that I have so far encountered two types of cam-driven machines: forward-facing ones like this Harris, but requiring a cam for zig-zag, and side-facing ones with built-in zig-zag but not capable of free motion fancy stitching, i.e., they can only vary the width of the zig-zag creating patterns this way, but they cannot make a wiggly curve consisting of straight stitches. And visa versa, disengaging the built-in zig-zag allows for a proper straight stitch when there’s no cam inserted (or with a special plain round straight stitch cam to prevent any sideways movement of the needle what-so-ever). The machine is very well built, with a complex set of joints driving the zig-zag and the cam mechanism. It does not appear to have stretch stitch. 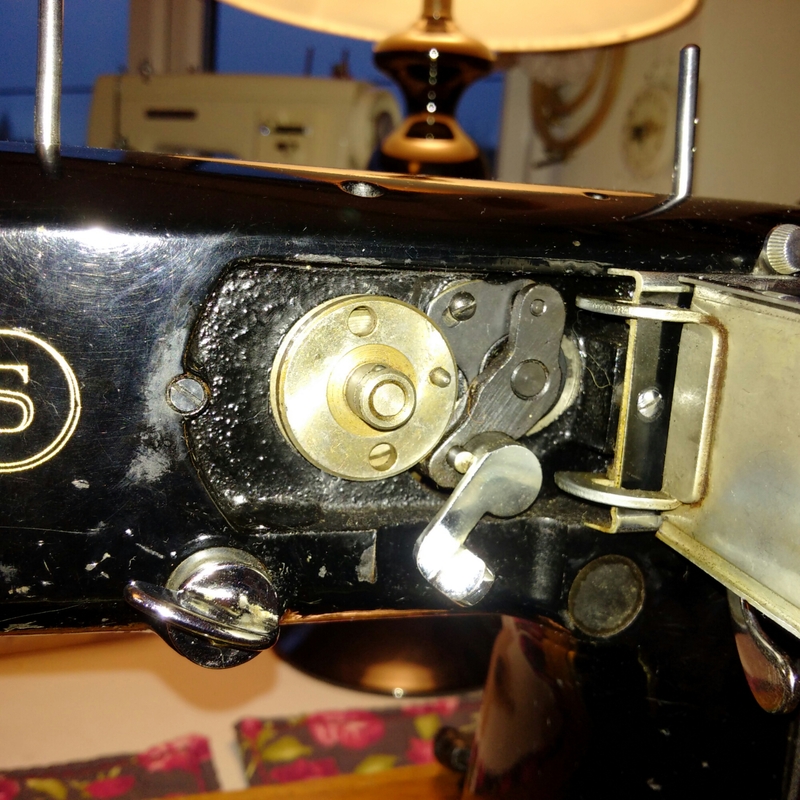 However, I don’t have a manual, and some of those levers look a bit puzzling.​ I am still unsure about the meaning of the I and II lever, as well as the little button on top of the stitch width lever which can be set straight or sideways. But before I could do any serious stitch testing, I had to repair the oscillating hook driver. It had a broken spring which made the hook wobble and make an incredible noise. I am amazed that the machine could still sew and hardly miss any stitches! 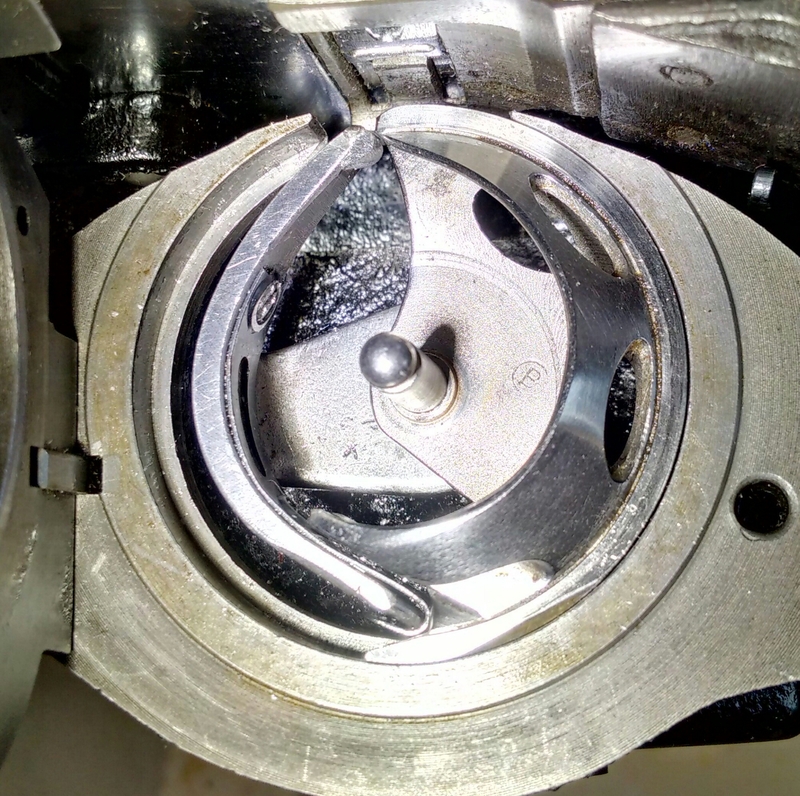 The obvious course of action was to replace the broken spring, which in turn necessitated the removal of the two screws that held it in place. That proved easier said than done! For no amount of creeping oil could free those screws, and eventually after a week of trying, I gave up on them. My second idea was to replace the whole driver, with the spring, screws, shaft and all, which required the removal of the old one. 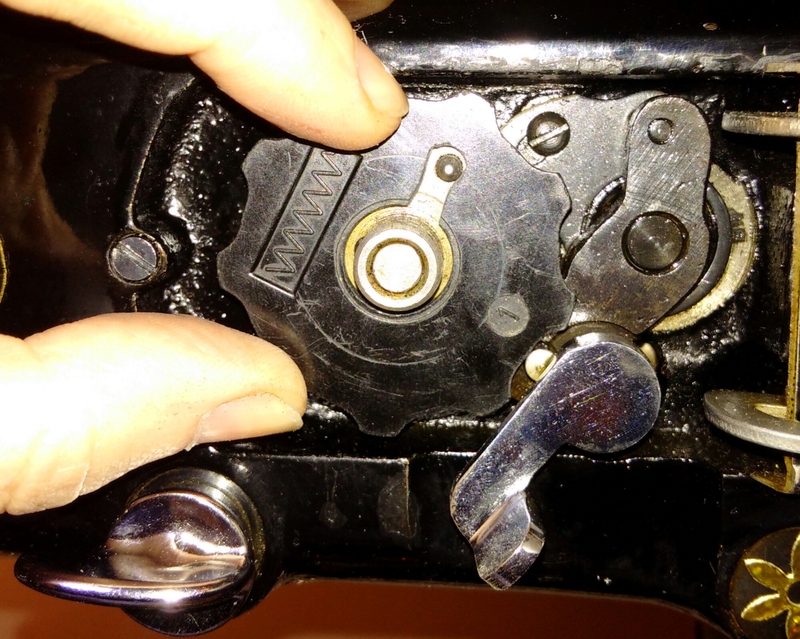 In my previous encounters with forward-facing oscillating hook mechanisms I always found the driver shaft secured in the gear with a pair of positioning screws – undo those, and the driver comes out easily enough. But in this case I found the shaft fixed to the gear with what looked like two pins, and the positioning screw only allowed for small adjustments. I believe that the whole oscillating hook unit was assembled separately and was not intended for dis-assembly. 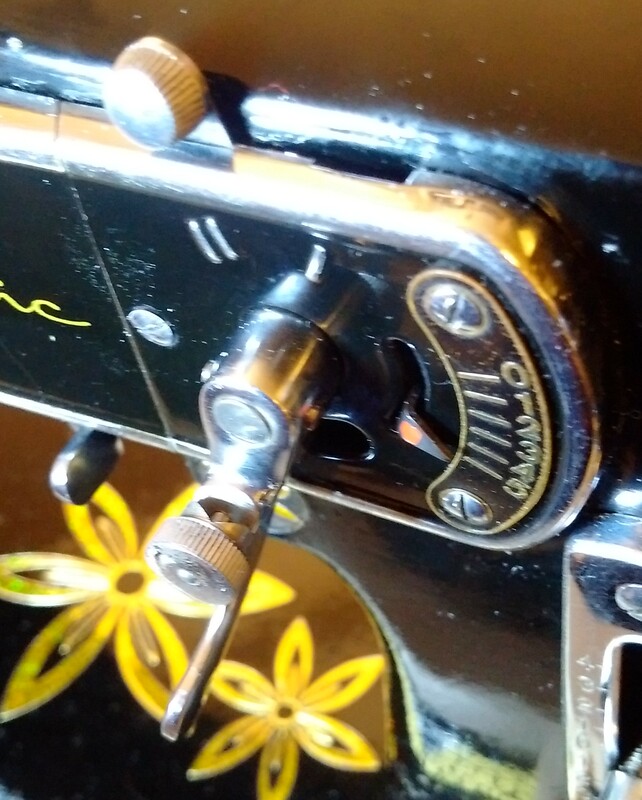 The advantage of this approach is that the hook cannot slip and knock off the timing too much, and I’m all for it, having spent half a day fixing my Frister+Rossmann suffering from this condition. The disadvantage is of course that I could not replace the driver to fix that spring! Ok, so I had to resort to illegal means now. All I needed was a spacer to fill the gap between the driver and the hook, so I decided to solder some tin onto it. Then I filed it nice and smooth, and since the Gods of Sewing Machines have not yet struck me down for this blasphemy, it must be Ok.
Congrats on finding out who made it Elena! Maybe a manual will turn up somewhere – at least you now know what manual to look for! I’m hoping to learn more about the machine I have. Haid & Neu 669272 Vega. I’d like to know when it was made. Google searches aren’t turning up much. Although it could be the way I am searching. Can you point me in the right direction? Thanks in advance. Hi, I’m no expert, but perhaps some collectors would know. Check out http://www.ismacs.net, they have information and a mailing list. Perhaps if you were to ask there, someone would know! This is where I got help on mine, too. Hi, You have a very nice and informative blog here. 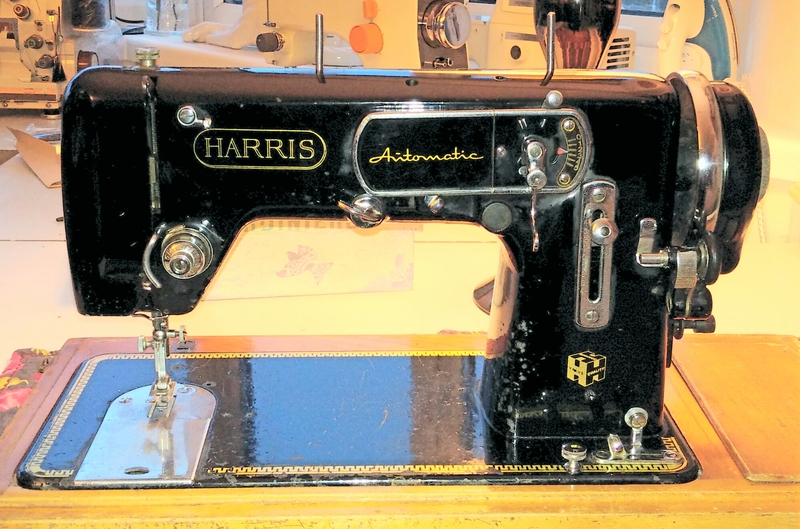 I used to have a Harris automatic a couple of years ago (I was renovating and selling old sewing machines at that time) but was never able to establish its German provenance, but you managed to crack it, well done! I bought another machine from Germany, it came with cams and a manual. I do not believe you can buy any of it separately, and I don’t know where you can download a manual in English, sorry. Saw one of these machines in a local charity shop this morning, with manual in English! Having read this post I am going to go back and get it if not too much money. Will keep you updated! Further to my comment earlier (it’s appearing below at the moment), I’ve now got the machine and the manual! It hasn’t got any cams with it so I’m assuming it will just do straight stitch and a basic zig-zag. I paid £20. I’d better set about finding out how to copy the manual……I’m not very familiar with doing such things, apart from just bunging it in the printer and copying it. The machine itself will have to wait until my 411G upstairs is up and running! Congratulations, Lizzie! It is truly a very good machine. Without the cams it’s just straight stitch and zig-zag, yes. Make sure the cam lever is disengaged – otherwise you won’t get zig-zag. 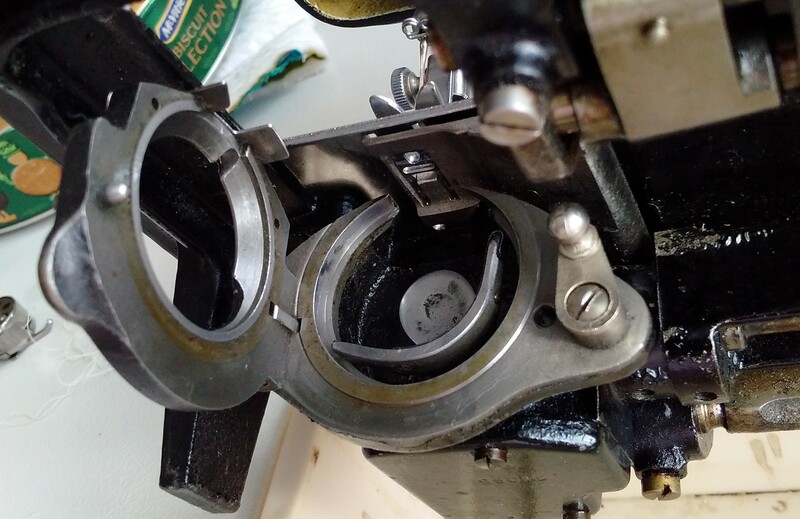 🙂 It is possible to use modified Singer flat cams with it, but you need to make a collar. Something I’m still planning to do! Hi Elena, I’ve spotted a nearly identical machine here, in Canada. Here’s a picture: https://i.imgur.com/hNfwP8b.png . As you can see, it’s a straight stitch only version of yours. 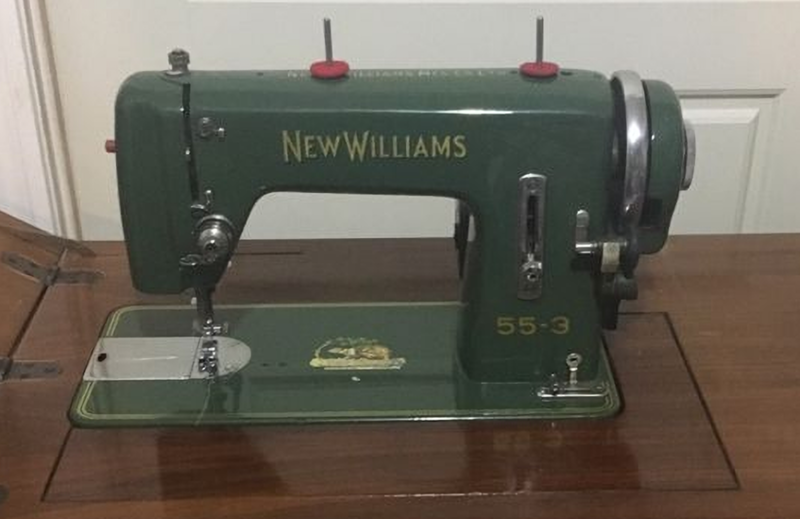 I was very intrigued as I knew “New Williams” was liquidated in 1929 and yet this one is clearly from the ’50s.